Figure 1: A “split primary” color wheel with warm and cool primary colors forming 4 color quadrants. The concept of warm and cool colors has been written about for hundreds of years. Most theories start with the classic six point color wheel (three primary colors and three secondary colors). A dividing line splits the wheel into warm and cool. The line location varies based upon the reasoning of the theorist. Regardless, the general idea is the warm colors are Red, Orange and Yellow; and the cool colors are Green, Blue and Magenta (Figure 2). 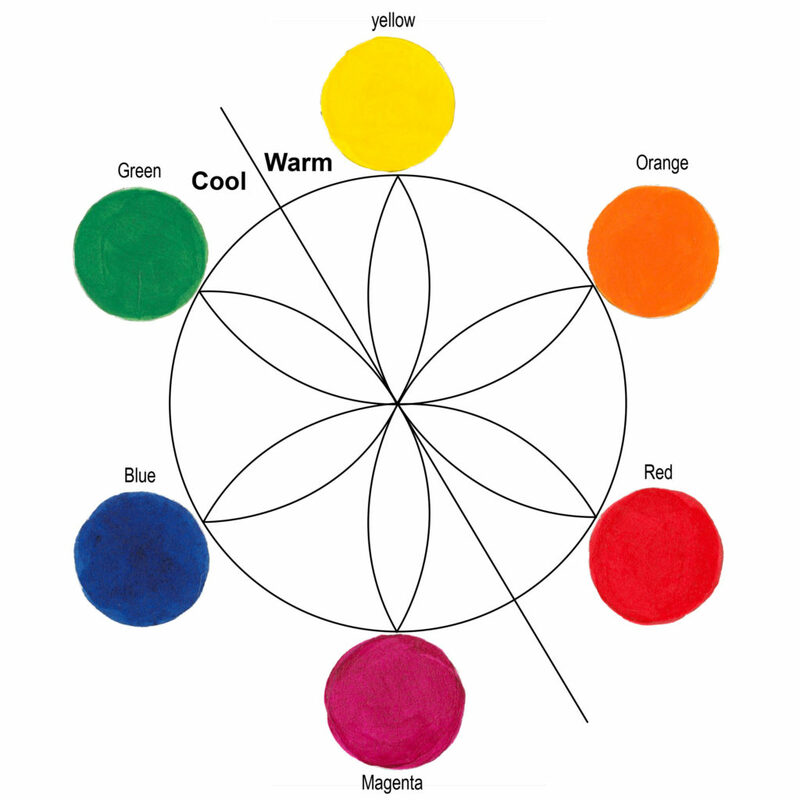 Figure 2: The classic color wheel divided into Cool and Warm halves. Compare “yellow” to “blue” and it’s easy to see yellow is warm and blue is cool. 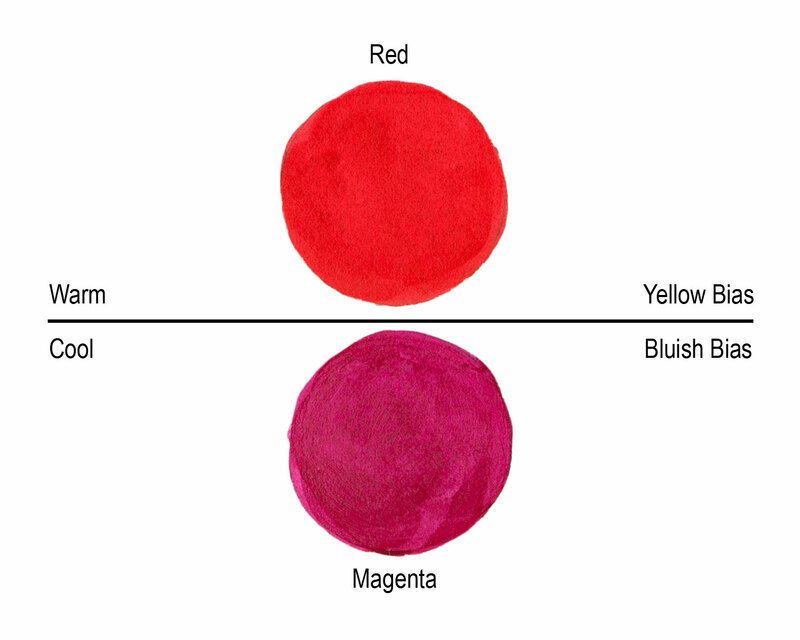 Comparing “red” to “magenta” might be less obvious since they are next to each other. But if you identify and compare the “color temperatures”, a bluish red (magenta) is cooler than a yellowish red (Figure 3). Describing how a color leans towards another primary or secondary is also referred to as its“bias.” A red, as we can see, can have a yellow or a blue bias. Figure 3: The reds are spit into a warm, yellowish red on top and a cool, bluish red (magenta) on bottom. Color temperature is also important during paint mixing. In order to make clean mixtures use colors with similar color qualities. For example, mixing a yellowish red with reddish yellow yields bright secondary oranges (Figure 4). In describing a color to someone, we often refer to color “bias”. A red can have a yellow bias or it can have a blue bias. 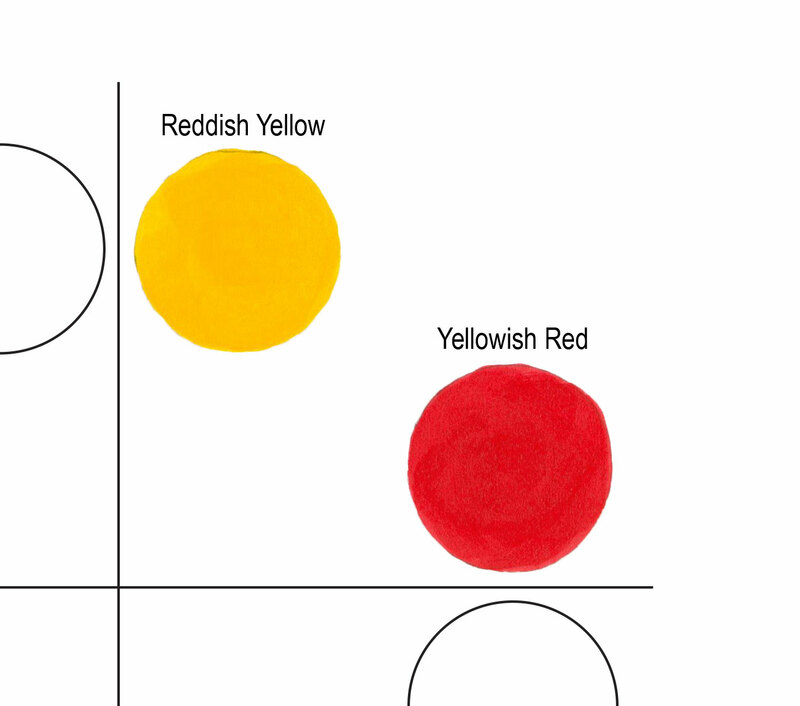 Figure 4: The Yellow Red Quadrant contains a reddish yellow and yellowish red. To identify color temperature you’ll need to learn how to see and identify warm and cool colors. Some colors are easy to discern, but looking at our 108 colors in our Heavy Body Acrylics line, “color temperature” gets tricky. In the world of paint colors, there are warm AND cool greens, blues, red, yellows, earth colors, blacks and whites. Comparing a warm red to a cool red and then compare those to a third color, you should be able to see if it’s yellower, bluer, or in between the first two reds. Once you begin to “see” the differences it becomes easy to identify any color. 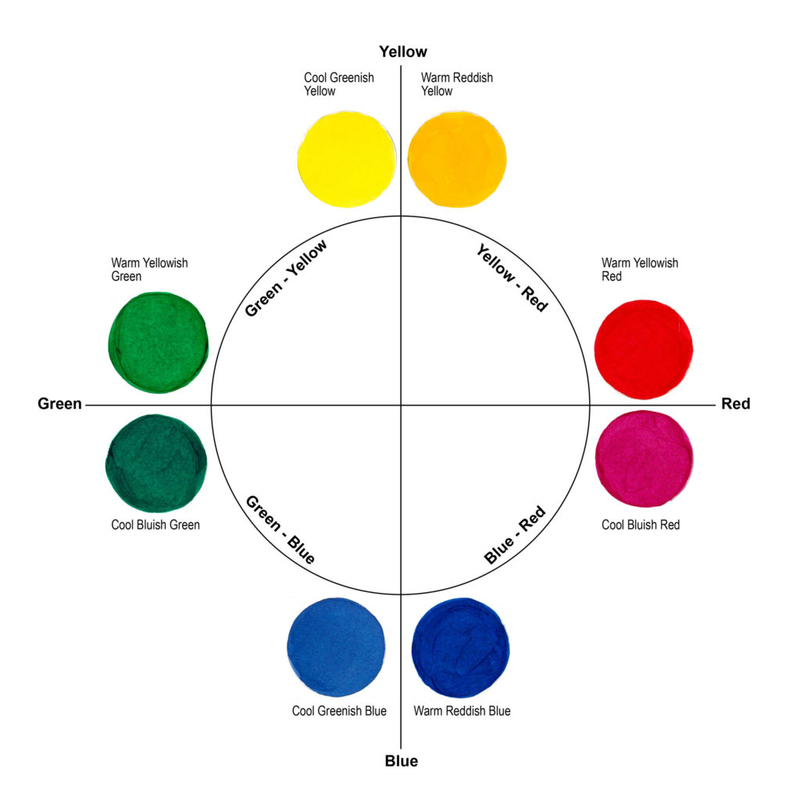 To make this as easy as possible, stretch out the color wheel to eight primary colors (Figure 1). The colors are on a grid. Yellow is at the top, with the left example being a cool yellow because it has a green bias, thus we describe this as a “Greenish Yellow”. The yellow to the right is a “Reddish Yellow” and identifies as a warm yellow (Figure 5). 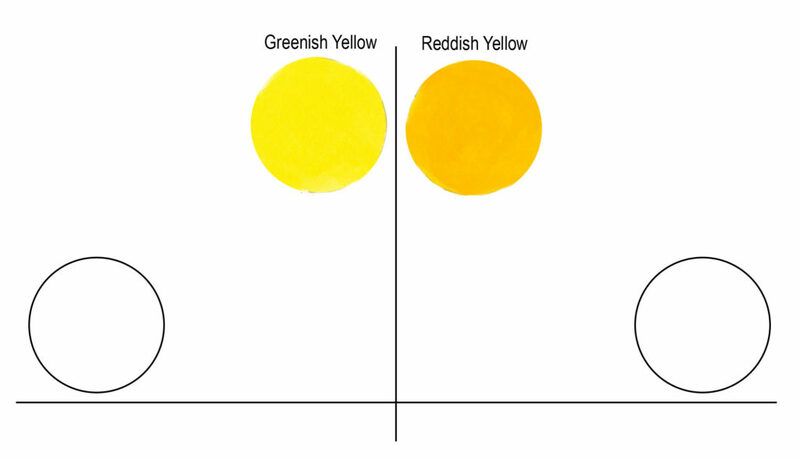 Figure 5: Yellows are divided with a cool greenish yellow to the left and a warm reddish yellow to the right. Clockwise, we move toward reds. The top red is a “Yellowish Red” because it has a yellow bias. Not by accident, the Yellowish Red is in the same quadrant as the Reddish Yellow. Mixed together the resulting orange is “clean” (Figure 4). Clean color refers to having no biasness resulting in a duller or “muddy” color. The lower red has a blue bias. Having the two reds next to each other makes it easier to identify the color temperature. Our “Bluish Red” mixes very cleanly with our “Reddish Blue” at the bottom right, resulting in vibrant purples and violets. Mixing the Yellowish Red with the Reddish Blue would make a dull maroon (Figure 6). 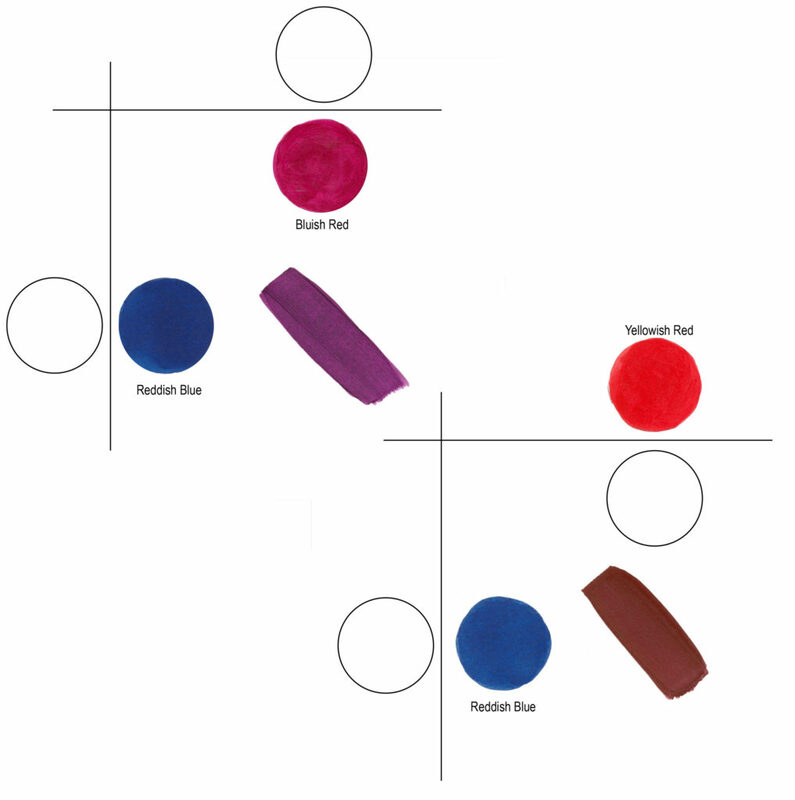 Figure 6: The upper left mixture shows a clean violet using a reddish blue with a bluish red. The lower right mixture uses the same blue with a yellowish red, resulting in a biased maroon color. Each quadrant lines up similarly. The “Greenish Blue” or cool blue mixes cleanly with the cool “Bluish Green”. 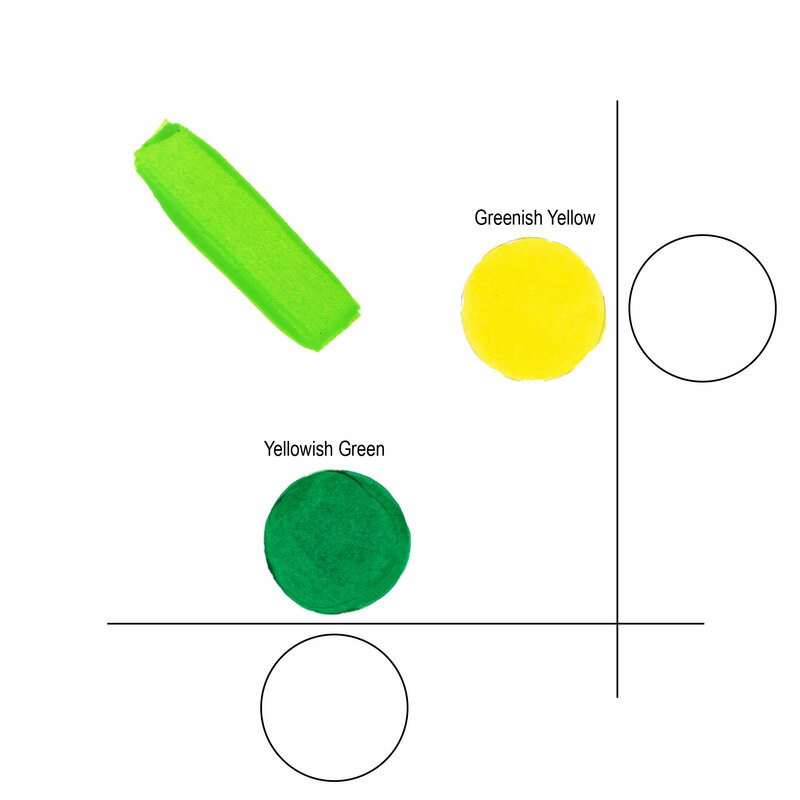 The “Yellowish Green” is warm and creates vibrant bright greens when mixed with its quadrant companion “Greenish Yellow” (Figure 7). Figure 7: Mixing yellowish green with greenish yellow yields a clean, bright green. Color temperature doesn’t line up neatly when mixing colors. By chance the warm Reddish Yellow and warm Yellowish Red work together, but the warm Yellowish Green mixes best with the cool Greenish Yellow. What’s more important is that you can identify the color temperature and its dominant bias so you can choose the best mixing color based on your needs and paint colors you have on hand. Below is a table that identifies the colors used to create this chart and additional examples of similar temperature colors (Table 1). That was well done! I didn’t know all that. Ok, I understand warm and cool colors. Now, how do I apply this knowledge when choosing colors going next to each other. For example pink tulips, what color green do I pick. Warm or cold? Thank you for your questions! If your pink tulips are made using Quin Magenta or Quin Red, then you have a cool color. If you want to the green to be in front of or at least at the same distance (as you would with the stem and leaves, I’d use a warm yellowish green. If you want the green to be the background color, then a cool bluish green would help push the flowers forward. Juxtaposed colors are a wonderful area of color theory to study and practice. Hi Michael, yes right, from what I know cool colours recede. It is a good idea that you made that pdf file containing list of warm/cool golden colors. Could you do the same for Williamsburg oils (with italian and french eraths included)? Thank you for your questions. I believe we are planning to provide the warm and cool designations for Williamsburg Oils and QoR Modern Watercolors in the near future. I’ll add them in below the GOLDEN listings when they become available. Hello – Interesting article and just to add a note: Newton’s primaries were blue and yellow. Thank you for your comments. According to “Color Systems in Light and Science” (Stromer, 1999), Sir Isaac Newton listed 7 primary colors in concert with the 7 sound intervals within an Octave of the Dorian Music Scale. He converted this from line into the familiar circle of which he is credited as the first to draw in 1678. Yes, Martha may be thinking of Robert Hooke or Christiaan Huygens here. i love these articles. thank you so very much for excellent resources. You are most welcome Janet! do you have a print available to order of the pfd? I find my printer does not do a good job on color. Your product posters are my studio “wallpaper”. I have the same problem with my printer. Thank you for your comments Cathy. I’ll be happy to pass your suggestion along to Marketing! Thanks David. I appreciate the feedback. Warm and Cool are terms we wanted to clarify simply, but it is hard to not get into this subject without identifying bias. I prefer to use bias rather than warm and cool to reduce confusion. Great link to the “battle”! i new artist and am trying to get into my head warm and cool colors, your article explained simply, please dont confuse me with bias whatever that is. Thank you for your comments. We tried to keep the technical jargon to a minimum for this article. The term “bias” refers to the direction a color leans. As the article describes, a red paint – unless perfectly balanced – will have either a yellow or blue bias. I like to use the phrase “yellowish” or “bluish” to describe a specific red paint which is in reference to the color bias. Overall, the terms you prefer to use: warm or cool color, yellowish or bluish color, yellow-bias red or blue-bias red, as long as you are able to make sense of it and most importantly be able to use that information to aid in painting is what it’s all about! Thank you for the positive feedback about the article and Just Paint. We moved to one printed copy a year but have committed to creating content every month for the online version at JustPaint.Org If you send an email to help@goldenpaints.com with your physical mailing address we can make sure you are signed up for the next printed issue! Sorry Marty if we haven’t replied to you earlier. Just Paint in the Print version is now being produced once a year. Our JustPaint articles now appear much timelier online and we have committed to try to update our work much quicker with two articles per month. The Print version will be an even more exhaustive piece than it had been in the past allowing for lengthier discussions of topics that we believe merit greater coverage. Any updates regarding the war/cool colors in the Williamsburg oil paints line? None so far, but it is on the project list! I think for many beginning/hobby painters, these issues are often treated in academic terms rather than practical. That seems often to be the reason for confusion. This is similar to the relationship between pigments and colours. Trying to explain how or why the same pigment has a different dried appearance between different manufacturers can be daubting. That is before you consider the various common names for the same pigment! Enjoyed your explanation and discussion very much, and the .pdf showing the warm/cool relationship of your various acrylic colours is most welcome! Thank you, Charles. I appreciate the feedback! The Blue that is between a cool red and a cool blue cannot be warm. Ultramarine Blue is not warm. Thank you for your comments. I believe that it is all relative and based upon what approach you prefer to work with. A blue with a reddish cast to it reads warm, when compared to a greenish blue. One of our favorite color sites, Handprint.com, states this very well. Thank you! Finally somebody who recognizes that the “warm/cool” notion is relative and does not occur right smack in the middle of the colour wheel. I’ve never been in agreement with those sources that slap a declarative warm/cool dividing line between yellow-to-red and magenta-to-green, and thought I must be missing something since hey, those people are experts writing books on art. Often on the very images they use to illustrate that “fact”, my eyes tell me that one of the colours used on the “cool” side is actually warm. I’ve also often had trouble with the colours some experts assign as primary; it always seemed to me that the bias of each mattered rather a lot. I work in polymer clay and have made countless colour chip samples mixing variously biased colours to work this out for myself. This article gives me the words for my intuitive impressions, and has wiped the fog of confusion away. I like your phrasing of “bias”, and will adopt it from now on; it expresses well how I feel about the differences. A bit of a *duh* moment, but I am glad I turn out not to be full of it. 😉 Once again, thank you. Thank you for your kind words. I too was confused about all of this, and I don’t believe there has to be so much confusion about color bias. Every time we create new color chart arrangements we play the exercise of comparing each color against every other color in our paint lines. The best advice I can add is to get a hand-painted color chart, cut it up into individual squares, mix them all up and re-arrange them onto a sheet of illustration board. Some are easy and some are near impossible, but it trains your eye to really look at them for inherent properties. Bravo! Your articles are so helpful. Thank you. Thank you, Michael. I have just begun my journey as a painter and am grateful to you. Your explanation clarified it for me perfectly: a color’s ability to appear warmer or cooler just depends upon what color it lies next to! Ba da bing! Thank you!!! You also said that to get “clean” colors, mix warm colors with other warms, cool colors with other cools. To get muddy colors, mix warms with cools. Ba da bing! Thank You!!! Michael, I would love to see an illustration of three color examples side by side: a warmer color, a cooler version of the same color, and the “pure” version of the same color (I believe the term for this is the “hue?”). I am guessing that a hue would contain equal amounts of warmth/cool. Is that correct? Would such a comparison be of value to us? Thank you for your comments and questions Judith. Hue refers to color, as in Chroma, Value and Hue. Chroma is how clean the color is, Value is how light or dark the color is, and Hue is the color space. For your color image request, we’ll have to work on that. We would need to use the computer to tell us what base color such as red sits directly on the line between warm and cool (neither a blueish red, or a yellowish red but squarely in between). Then we could identify either side of it, far enough away to be recognizable by the eye. I think it should not be explained on paint colors. I was wondering about this question, and I think everything may be just in blue cons – If there is some blue light, it’s cool color. If there’s not, it’s warm. Thank you for your input. It is appreciated! Thank you for sharing such helpful and needed information. I am a beginer, with a life long desire to create beautiful works. I never understood why mixing some colors produced dull muddy colors. I am about to pull out my paints and experiment with the information you have provided. Right now I only have craft acrylics, however, God willing soon I will begin purchasing a tube at a time of better quality acrylic paint. I CAN HARDLY WAIT TO PAINT WITH GOLDEN. I look forward to reading and learning more from your posts. Thank you. You are most welcome for the information, Monica. Many artists will start with less expensive paints and increase quality as they are able to. This goes for paints, gessoes, mediums and painting surfaces. Less expensive, clean colors are going to help out and these can be “stretched” out with the use of mediums such as Glazing Liquid, Gloss Medium, and Soft Gel. I would suggest colors like Napthol Red Light, which is less expensive than Pyrrole Red but will yield similar mixing results. Chromium Oxide Green is a great yellowish Green that is often overlooked compared to Phthalo Greens, although the phthalos are very highly pigmented and can be extended with mediums quite a bit before they become too transparent. Try 10:1 medium to paint (Yes! That much!) to see how the paints behave and also what the medium does to the paint in terms of feel and look upon drying. Contact us at help@goldenpaints.com if you have any other questions!